This shelf houses all of my academic literature (Hebrew Bible, Dead Sea Scrolls, Rabbinic Literature, Jewish History, Linguistics and [primarily Semitic] Languages). You can’t see all of it, but it’s the least pretty of my three shelves, so let’s move along. Ah, now we’re talking! This is my Primary Literature shelf #1. It houses various copies of the Hebrew Bible (most notably Miqra’ot Gedolot, Torat Hayyim and BHS), as well as all of my versions (Samaritan Pentateuch, Septuagint, Peshitta, Vulgate, and two texts in Bohairic Coptic). It also houses my favourite English translations (Geneva Bible, KJV, RSV, NRSV and the Jerusalem Bible) and some material from Qumran/Masada. If you squint, you will notice Josephus, Philo, the “Apocrypha” and “Pseudepigrapha” (critical editions, all), a critical edition of various Gnostic texts, a wonderful biblical index to the rabbinic literature (again, thanks, Rivqa! ), a couple of copies of the Mishna (Hebrew and English) and both Talmuds. I have to sit on my bed to access the Talmuds and the Ein Yaakov, but that’s all part of putting a library in a bedroom. Isn’t she beautiful! This is my Primary Literature shelf #2, and the most recent addition to the family. 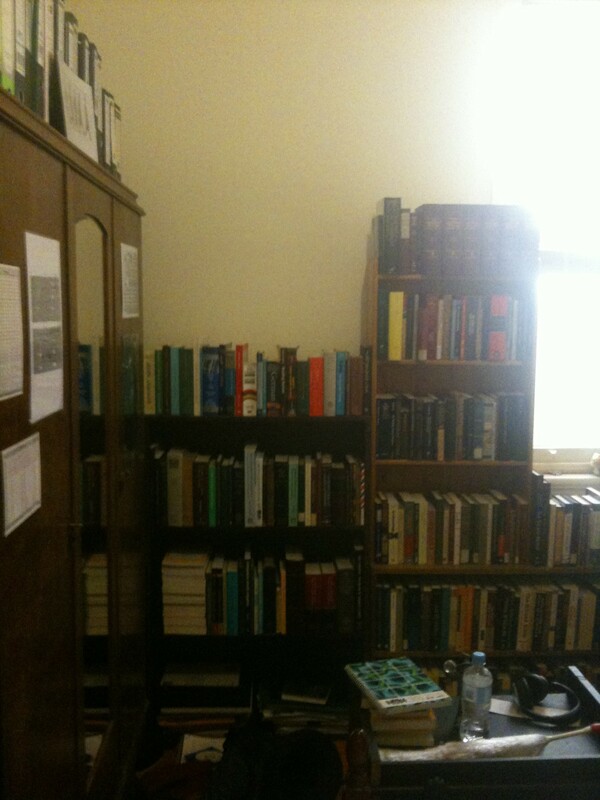 You can’t see the bottom shelf in the photo, or the rightmost part of the top shelf, but it commences with facsimile editions of both the Aleppo and the Leningrad Codex. Afterwards is my large collection of midrashim (Midrash Rabba, Midrash Tehillim, Pirqei d’Rebbi Eliezer, Midrash Tanchuma, Pesiqta d’Rav Kahana, Pesiqta Rabbati, Tana d’Bei Eliyahu, Leqach Tov, Seikhel Tov, Yalqut Shim’oni, Mekhilta d’Rebbi Ishmael, Sifra, Sifrei, Mekhilta d’Rebbi Shim’on bar Yochai and Midrash Tannaim). 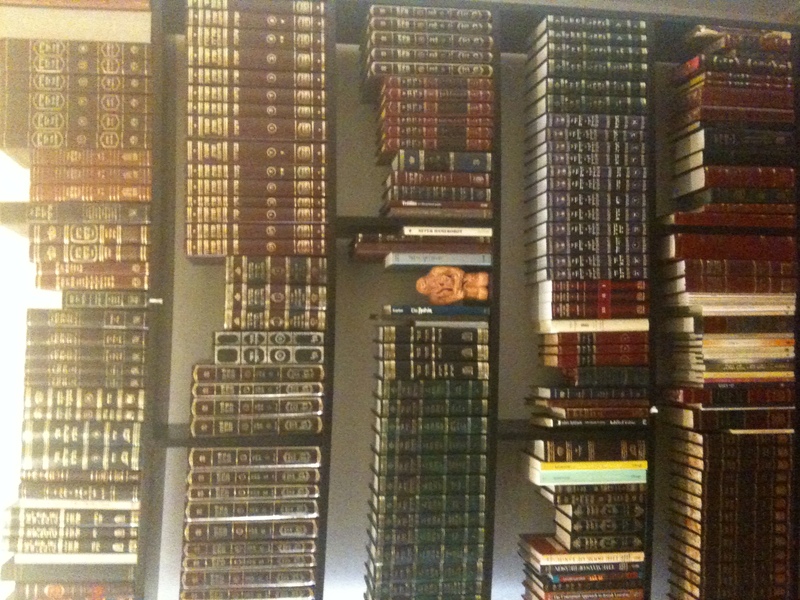 The top shelf also contains what little I have of the Geonic literature: the Iggeret of Rav Sherira Gaon, the Sheiltot of Rav Achai Gaon, the translation of the Pentateuch into Arabic by Rav Saadiah Gaon, and Rav Saadiah Gaon’s siddur. Completing the top row, I also have Siddur Vilna (the nearest thing to a critical edition, that I have yet encountered, of the Ashkenazi nusach), as well as two copies of the Haggada, and a set of Ashkenazi machzorim that once belonged to my grandfather. Those have been cut off on the left. 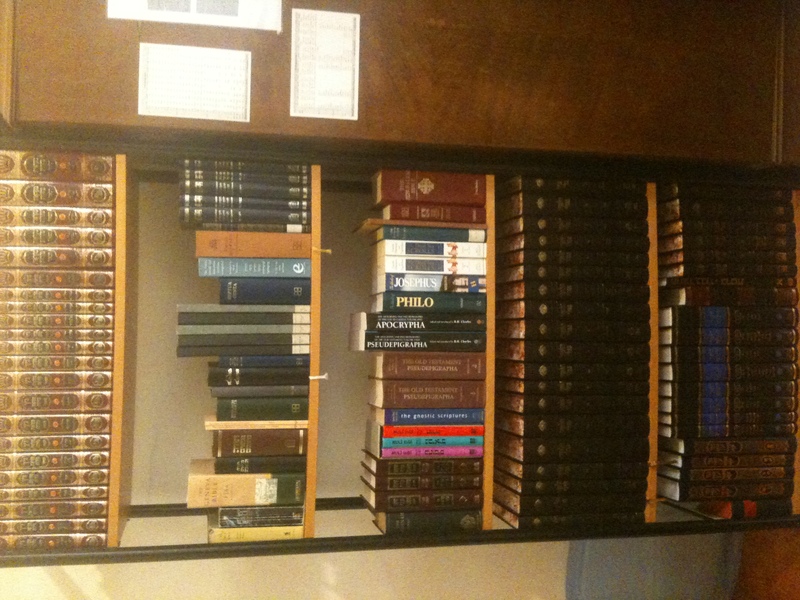 Continuing downwards, this shelf houses Rambam’s Mishne Torah (in Shabbetai Frankel’s beautiful fifteen-volume critical edition), the Arba’ah haTurim, the Mishne Berurah, and various other lesser (and more contemporary) works of halakha. Entering the realm of the kabbalah, I’ve some early literature (Sefer Yetzirah, Sefer haBahir, Sefer Raziel haMal’akh), as well as three editions of the Zohar, and a variety of kabbalistic siddurim. My philosophy (“chaqirah”) component is very small, and focuses chiefly on works by Judah haLevi, the Rambam, Luzzato, Soloveitchik and Leibowitz, but my Sifrei Hassidut section is fairly long, and mostly Chabad. Nonetheless, it does contain a small selection of texts from Breslov, Satmar, Toldos Aharon, Shomer Emunim and Spinka, as well as the Noam Elimelekh. Gorgeous! And you’re welcome, again. Bah, children are overrated. I’d rather hug a book any day (mmm, crinkly…). 1) To just give in and buy a library already. 2) A copy of Delicious Monster. Delicious Monster, as in the makers of Delicious Library? I have a copy, but they don’t recognise 99% of the books that I own, and I only use it for my academic literature. 1) Is there any room (or desire) to expand into secular texts? 3) I hope you have it all insured… because the photos could provide for excellent evidence in the event of a claim (though not sure how one values a Golem). Actually, I’ve a pretty large “secular” shelf in my living room. That contains poetry, plays and (chiefly) novels, and spills over into a second shelf which is devoted to sciences, comparative religion, and miscellaneous Torah texts that didn’t quite make the grade. Nothing is insured, which is foolish, given that I’ve also an old and rare books cabinet, filled with… well, with old and rare books. Fire and damp are my two chief enemies, but I’m hoping they’ll both come at the same time and cancel each other out.